The Phoenix Summit Challenge (a.k.a. 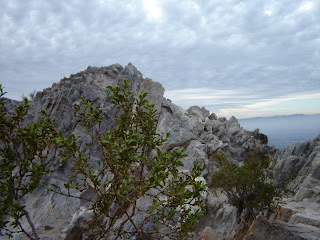 The Seven Summits of Phoenix) Is held annually in November. However, if you want to tackle the circuit on your own, here's the plan: CamelbackMountain • Piestewa Peak • North Mountain • Lookout Mountain • Gila Valley Lookout, South Mountain • Shaw Butte • Shadow Mountain. Can’t get to all of the continents of the globe to conquer the famous “Seven Summits”? Well, then, why not trash a weekend conquering the seven summits of Phoenix. All of the seven highest peaks in the metro Phoenix area are easily attainable and can theoretically be achieved in a single day. However, most hikers will want to break the adventure into two parts in order to relax and enjoy the views on each high point. DAY 1: Southern Section Part one starts at the southernmost destination and works northward. 1. GILA VALLEY LOOKOUT: South Mountain Park 2.660 feet LENGTH: 7 miles RT ELEVATION GAIN: 1.310 feet RATING: difficult GETTING THERE: From Phoenix, follow Central Avenue south all the way to the end where it flows into South Mountain Park. Just past the park entrance gate, turn left into the Activity Complex. Drive past the Interpretive Center and go all the way to the end of the road and park. The hike starts at the Holbert trailhead directly across the road. South Mountain Park is open from 5:30 a.m to dusk and access and parking is free. There are restrooms and running water at the trailhead. HIKE: Follow the Holbert Trail all the way to the end to where it meets the National Trail. 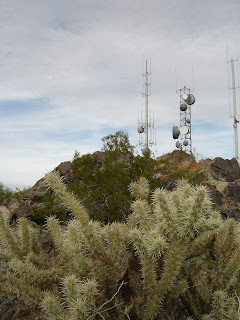 From the junction, follow the TV Tower Road for about a mile to the Gila Valley Lookout. 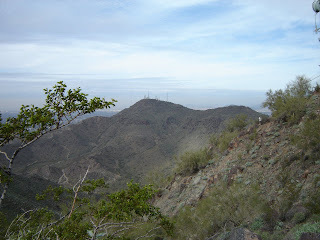 The actual high point of South Mountain (Mt. Suppoa, 2,690 ft) is off limits, so the Gila Lookout is the next best thing. 2. CAMELBACK MOUNTAIN: City of Phoenix 2,704 (highest point in Phoenix) LENGTH: 2.3 miles RT ELEVATION GAIN: 1,300 feet RATING: difficult GETTING THERE: From South Mountain Park, drive north on Central Ave to Camelback Road and turn right (east). Continue on Camelback Road to 44th Street and turn left (north). Stay on 44th Street as it turns into McDonald and continue on McDonald, past Tatum to the turn off on the right for Echo Canyon Parkway. Be prepared to wait for parking at the trailhead. HIKE: Just go up. And up, and up. 3. PIESTEWA PEAK: Phoenix Mountains Preserve 2,608 feet LENGTH: 2.4 MILES RT ELEVATION GAIN: 1,190 feet RATING: difficult FEE: beginning in "early fall" 2010 there's a $2 daily parking fee. For more info, visit: http://phoenix.gov/PRL/passupdate.html GETTING THERE: From Camelback Mountain, exit the Echo Canyon trailhead and head north (right) onto Tatum Blvd. Continue on Tatum to Lincoln Drive and turn left (west). Drive on Lincoln past 32nd St and past the 24th St interchange. Lincoln will turn into Glendale Ave. Turn right onto Squaw Peak Drive and follow the signs to the trailhead. HIKE: This is an urban treadmill used by the local firefighters, athletes and spandex-clad beautiful people. But, don’t let the fact that you may be old and ugly keep you away. Carry plenty of water, wear sturdy boots and you too can enjoy Phoenix’s most popular hike. DAY 2: Northern Section Part two starts at the northernmost destination and works southward. 4. LOOKOUT MOUNTAIN: Phoenix Mountains Preserve 2,054 feet LENGTH: 1 mile RT ELEVATION GAIN: 475 feet RATING: Moderate GETTING THERE: From Phoenix, drive north on SR51 (Piestewa Frwy) and turn west (left) onto Greenway Road. Continue on Greenway to 16th St. and turn south (left). 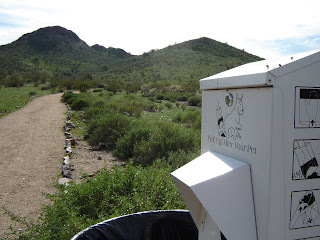 Follow 16th St uphill to a nice trailhead near a water tank. HIKE: Head right from the trailhead sign and connect to the summit trail 150. At the first unmarked junction, hang a left for the most direct route to the summit. If you miss that subtle turn off, don’t sweat it, just keep selecting the uphill paths and you’ll end up on the summit eventually. 5. SHAW BUTTE: Phoenix Mountains Preserve 2,149 feet LENGTH: 5 miles RT ELEVATION GAIN: 670 feet RATING: Moderate GETTING THERE: From Lookout Mountain, head back to Greenway Pkwy and go left (west). Continue on Greenway Pkwy to 7th St and turn left (south) Follow 7th St south to Thunderbird Rd. and turn right (west). Follow Thunderbird west and take a left onto Central Ave. The trailhead parking area is located on the right side of the road. Once again, you may need to wait awhile to get a parking spot. HIKE: This is a loop hike. At the trailhead, go left onto trail 306 and follow it to the summit. From the summit, follow the old paved road back down. 6. NORTH MOUNTAIN: Phoenix Mountains Preserve 2,104 feet LENGTH: 1.6 miles RT ELEVATION GAIN: 614 feet RATING: moderate FEE: beginning in "early fall" 2010 there's a $2 daily parking fee. For more info, visit: http://phoenix.gov/PRL/passupdate.html GETTING THERE: From Shaw Butte, go back onto Thunderbird and turn right (south) onto 7th Street. Go south on 7th St. to Peoria Ave and turn west (right) into the park. Follow the one-way park road to the Maricopa Ramada parking area. HIKE: The trail begins on a steep, dirt path and then connects with a paved road that leads to the top of the hill. Once at the end of the road, look for trail 44 to the left. It leads to the highest accessible point as well as a scenic ridge. 7. SHADOW MOUNTAIN: Phoenix Mountains Preserve 1,928 feet LENGTH: 1 mile RT ELEVATION GAIN: 440 feet RATING: Moderate GETTING THERE: This under-appreciated gem of a mountain is accessible from several points in residential areas. We selected the 25th Place trailhead. To get there from North Mountain, exit the park and go south (right) on 7th St. to Cave Creek Road. Turn right onto Cave Creek Road and drive north past the big church. Just before reaching Greenway Pkwy. turn right onto Claire. Follow Claire past 25th St. and take the next right onto 25th Place (unmarked road). The trailhead is at the corner of 25th Place and Acoma. Park along the retaining wall. HIKE: A sweet little traipse through the desert with a short steep scramble near the top. The summit offers up pleasant views of the surrounding area including a weird-looking reservoir and multi-million-dollar homes under construction. 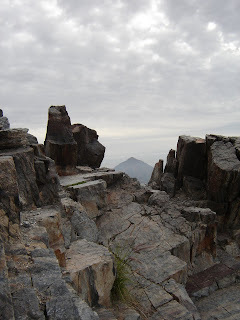 I hiked Piestewa Peak for the first time on Jan. 22 and I really enjoyed myself. I took the Summit Trail to the top of the mountain and it took me about 2.5 hours, however I was not in any rush. Several people would pass me and actually make it to the top and start heading back down again before I even reached the highest point of the peak, but this didn't bother me at all. I was taking my time and appreciating all the plant life and wildlife that the trail had to offer, especially since Phoenix had just experienced three days of non-stop rain. The post mentioned how many serious athletes and experienced hikers were on the trail, and I can definitely attest to that observation. However, the difficulty of the trail was more than I expected, I still made it to the top without much trouble.